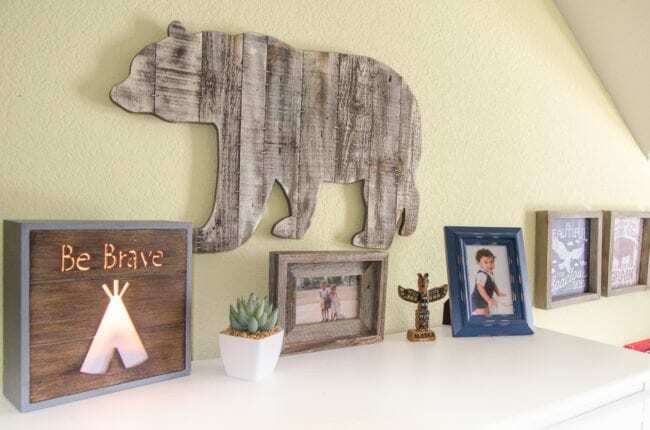 Products in this post from Minted were all selected by me, but provided by Minted in exchange for adding their affiliate links to the post. We adore every one of them in person! You know how one thing always leads to another? 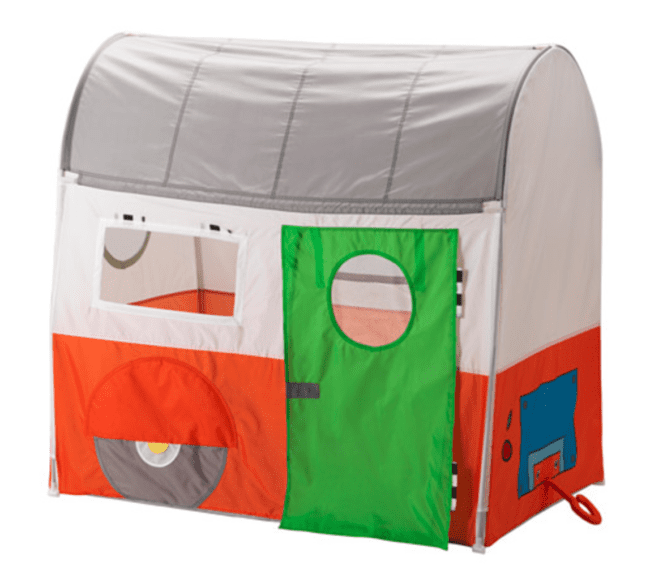 My mom and I were in Dallas at IKEA back in May and found the CUTEST play tent ever. 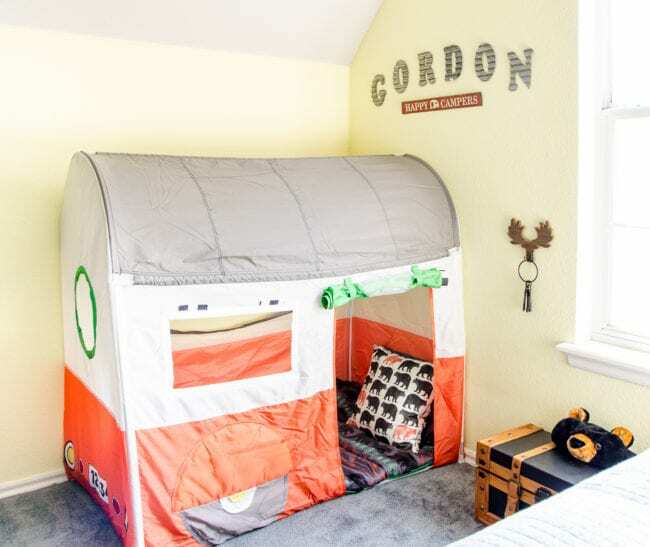 Since my 3 year old nephew and brother have been staying at mom’s this year while my brother finishes a full-time course, we decided the tent would be a great addition to make the former guest room more special for him. Fast forward a month, and my nephew went to visit his mom out of state. We all desperately needed a distraction from how much we missed him, so we threw ourselves into adding more than just the tent. It turned into a surprise room update! 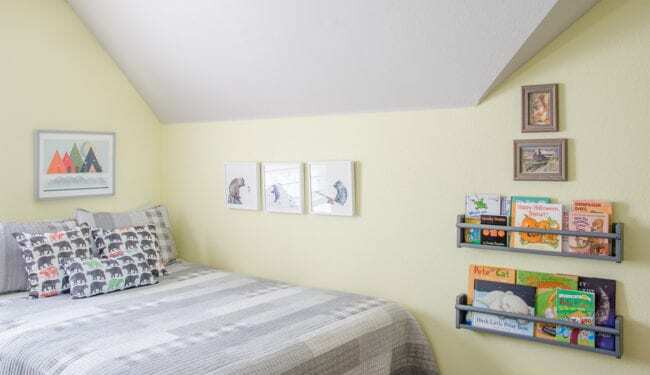 It’s amazing how much you can change the feel of a grown-up guest room into a grandson room with only accessories. We didn’t make any paint, carpet, or furniture changes! 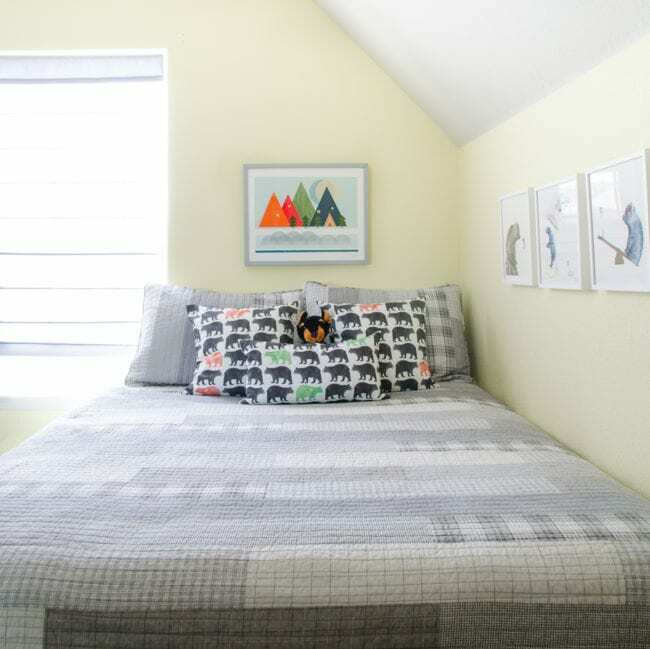 Mom did a great job finding a new quilt that works for a little boy’s room, but will work just as well when he is older. She also added a cordless roman shade. 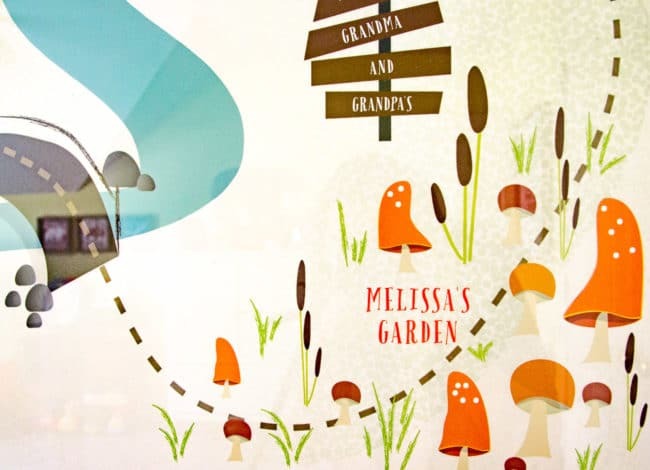 About the time we started the update, I got an email from Minted that they were launching a new line of children’s art. I took a quick peek and immediately found perfect pieces for our theme. I reached out to the person I worked with on our little winter Gallery Wall last year, and he was kind enough to send us some art and pillows for the room so I could show you some of the new collection! 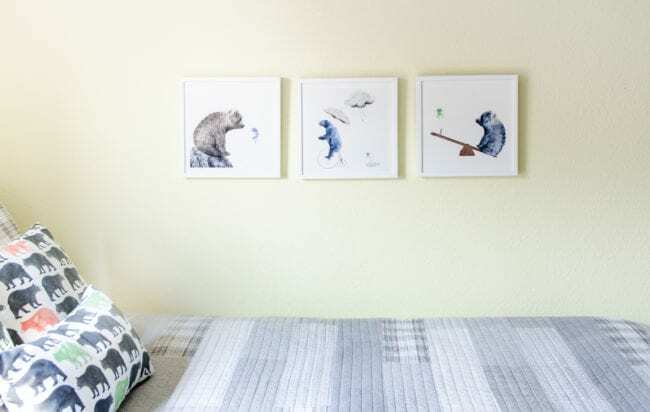 Along the side of the bed, we added a series of prints by Maja Cunnigham that were too cute to pass up. Since the ceiling slopes down, using three 11 x 11 prints worked perfectly. On the same tent-finding IKEA trip, we grabbed some wall racks to create an easy to reach library. It’s the perfect spot to hold his current favorite bedtime stories. Next to the new mini-library, we’ve have one more piece of Minted art. 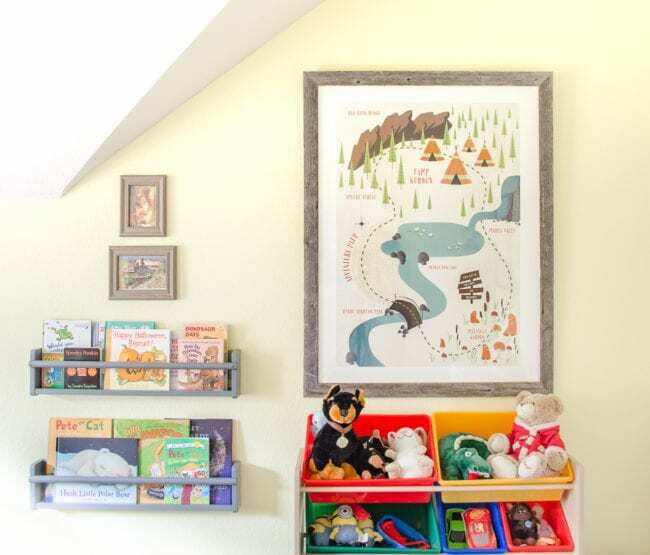 He LOVES maps, so I was thrilled to find this camping-themed outdoor ‘map’ for him. All the words on the art are completely customizeable when you place your order! The lake in the middle shows the name of our family vacation spot. We named the mushroom patch ‘Melissa’s Garden’ since he loves coming to see the tomatoes in our veggie beds. On the other side of the room, we picked up a few accessories locally for the top of the existing dresser. The old nightstand became a perfect play station for one of his favorite toys. 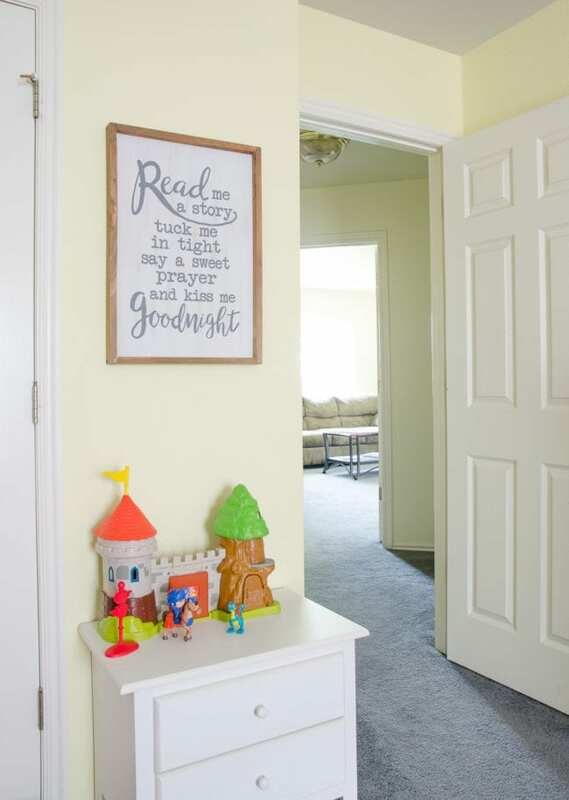 I love that we were able to swap this guestroom into a room that my nephew LOVES with no permanent changes. 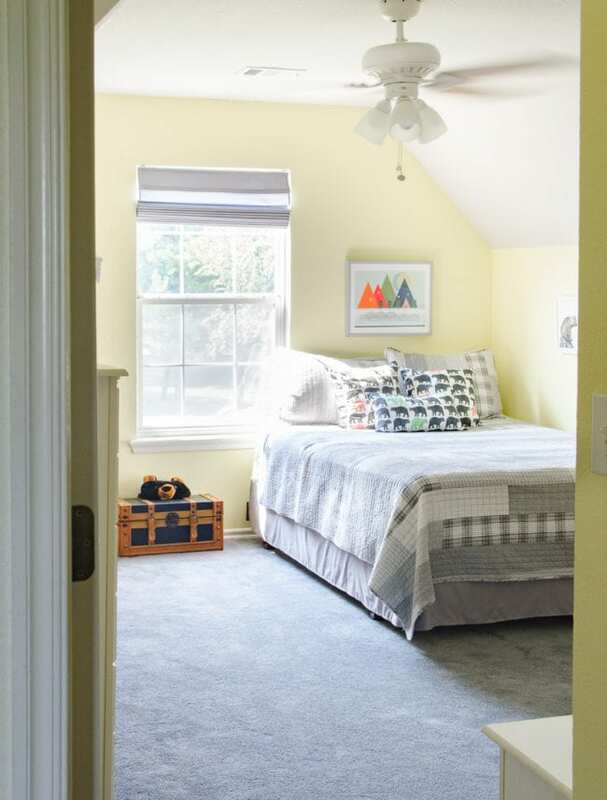 Dramatic floor to ceiling makeovers are always exciting, but don’t get stuck thinking you have to wait for the perfect time and budget for something like that. It’s amazing what some new bedding and art can do! I love it! It really is amazing to see the power of just a few accessories! The camping theme is so adorable. Thank you! We were so excited when we found so many things to match the tent! This is fantastic! What a lucky nephew/grandson!